Even as we celebrate the return of our military from wars in the Middle East, we are becoming increasingly aware of the struggles that await veterans on the home front. 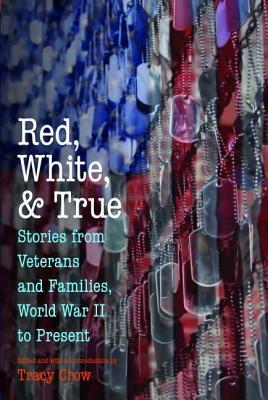 Red, White, and True offers readers a collection of voices that reflect the experiences of those touched by war—from the children of veterans who encounter them in their fathers’ recollections of past wars to the young men and women who fought in the deserts of Iraq and Afghanistan. The diversity of perspectives collected in this volume validates the experiences of our veterans and their families, describing their shared struggles and triumphs while honoring the fact that each person’s military experience is different. Leila Levinson’s powerful essay recounts her father’s experience freeing a POW camp during World War II. Pulitzer Prize–winning author Tracy Kidder provides a chilling account of being a new second lieutenant in Vietnam. Army combat veteran Brooke King recounts the anguish of raising her young children by day while trying to distinguish between her horrific memories of IED explosions in Baghdad and terrifying dreams by night. These individual stories of pain and struggle, along with twenty-nine others, illustrate the inescapable damage that war rends in the fabric of society and celebrate our dauntless attempts to repair these holes with compassion and courage. Tracy Crow is a former Marine Corps officer and the author of Eyes Right: Confessions from a Woman Marine (Nebraska, 2012) and On Point: A Guide to Writing the Military Story (Potomac Books, 2015).